Welcome to Digital Digest! 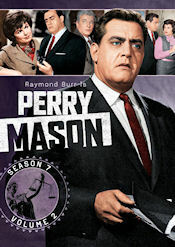 This week, we've got (after our regular news, of course) a review of Perry Mason - Season 7, Volume 2. Let's get going! It has been a slow news week, but Warner Archive has put a little zest in that with a few new releases that were made available on Tuesday. First up comes The Courtship of Eddie's Father - The Complete Second Season. The three disc set includes all 24 episodes of the second season of the classic series starring Bill Bixby as a widower raising a young son. Warner Archive is also busy with releases of The Flintstones, as they began selling The Flintstones - Prime-Time Specials Collection, Volume 1, The Flintstones - Prime-Time Specials Collection, Volume 2, The Flintstones - I Yabba Dabba Do, and The Flintstones - Hollyrock-a-Bye Baby. All of that should "yabba dabba do" a lot for fans of the modern stone age family! Hulu and Viacom announced an expansion in their partnership this week. Unfortunately, this won't have much of an effect for the free Hulu customers, but for those subscribing to Hulu Plus, the new agreement will bring new content from Viacom cable networks to the streaming service after they originally air. For now, this deal focuses on Nickelodeon, which has essentially nothing for us to really cover here, but it will also include other networks, particularly TV Land, as it expands over the next few months. Most likely, this means that we'll see some of the TV Land original sitcoms appear on the service. When we know more, we'll let you know what we find out. Tuesday (October 16) is a day of "completeness," as many complete series releases hit store shelves. These begin with Cagney & Lacey - The Complete Series. There seems to be a bit of confusion regarding the release of this set, however, as amazon.com and amazon.ca both show it shipping in November, but press materials (as of the past few days) have all indicated a release on Tuesday. In any event, a better bet may be to order it directly from the official website, where you can get the deluxe version of the set (which includes all of the "lost" episodes). The website indicates you'll be able to order from there this weekend. A more affirmative complete series release on Tuesday is Universal's release of Columbo - The Complete Series. And Acorn Media has the "supersized" The Red Green Show - The Complete Series DVD set, a 50 disc set containing every episode of the series. Of course, if you only want to spend a few bucks, there are some smaller sets on Tuesday as well. Fans of The Office can enjoy some Christmas parties with The Office - Secret Santa Pack, a single disc release containing four episodes of the series. Mill Creek takes That '70s Show into high definition with That '70s Show - Season Two (Blu-ray). And finally, Shout! Factory moves a season ahead with a classic '80s detective drama with their Shout! Select release of Simon & Simon - Season Seven. The set begins with "The Case of the Ice-Cold Hands," where Perry's seemingly ordinary day of holding horse race tickets turns into a murder in the winner's circle. An author creates an over-controlling stepmother in her latest novel in "The Case of the Bountiful Beauty," but what will happen when her boyfriend's similar step-mother turns up dead? A woman is accused of killing her husband in "The Case of the Nervous Neighbor," but an occurrence of amnesia may complicate her case. An ex-boyfriend is accused of murder after a woman's husband is murdered in "The Case of the Fifty Millionth Frenchman." In "The Case of the Frightened Fisherman," a dispute between a chemist and his boss gets even more complicated when the chemist's wife sides with his boss, and, oh yeah, turns up dead. A reporter accuses a fire chief of arson in "The Case of the Arrogant Arsonist." In "The Case of the Garrulous Go-Between," a woman's visit to a fortune teller tells her more than she'd like to know. A housekeeper is convinced that her boss is trying to kill his wife in "The Case of the Woeful Widower." Perry's involvement in a search for a missing son given up for adoption becomes much more complicated in "The Case of the Simple Simon." In "The Case of the Illicit Illusion," Perry defends a woman accused of killing her husband's business associate. A man is pretty sure that he has found his presumed dead wife outside of a hotel in "The Case of the Antic Angel," but when she denies it and later turns up dead, who do you think will be blamed? Perry's latest case involves a fake kidnapping, a real blackmail scheme, and of course murder in "The Case of the Careless Kidnapper." A college dropout is accused of killing his ex-boss in "The Case of the Drifting Dropout." In "The Case of the Tandem Target," a man faces two attempts on his life, and he survives one... but in the other, his stepdaughter's boyfriend is now the accused. The season ends with "The Case of the Ugly Duckling," where a heiress must marry within a year to inherit her family toy store, and her controlling uncle demands that she marry somebody immediately. Unsurprisingly, somebody turns up dead here, and somebody is accused of that murder. There hasn't been much change in the packaging since about the third season, so obviously, this one is just like the rest. On the cover, there is another large color photo of Perry, along with several photos of other cast members on top. On the back, there are some black and white cast photos, along with a description of the season. Inside the case (a standard Viva case, unsurprisingly), you'll find the four discs, which really don't have any artwork, and just have the series title on a gray background. Episode titles are printed on the disc, but there are also descriptions and airdates inside the case. The menus on this set are pretty basic, but they get the job done without any real problems. The main menu has a still photo of Perry on it, and all of the episodes are listed. There is also a Play All and Subtitles option. Everything does exactly what it sounds like it should do. There are no special effects, no animated transitions, no music... just plain and functional menus (though on the positive side, this does mean that the menus are very quick). Each episode has eight well-placed chapters placed throughout the episode. The video and audio quality of the episodes is top-notch for a series this old. I think that this series could truly shine on Blu-ray, but with nine seasons already being divided up into two sets per season, I'm not sure that a Blu-ray release would be feasible. There are a few defects such as grain and debris, but it probably won't bother most people. The audio is a (predictably) mono track, but it sounds wonderful for what it is, with little crackle in it. Each episode has English subtitles. Special features? Not a single one. The previous 13 season releases didn't have any, so it isn't surprising that the fourteenth release doesn't either. It really is amazing how such a predictable show can still be fun to watch on DVD. There really wasn't any other series as successful as this one in all of TV history which was as predictable and formulaic as this one, yet is still enjoyable. Even though you always know how every episode is going to end, the fun is in watching how the details will bring that win to Mason's client, which are often unusual in each and every episode. I just wish that the DVDs were less predictable on special features. With four more releases of this series to go (and one is coming up in just a few short months), I'm expecting more of the same, but at least every episode (in my opinion, at least) was consistently good from beginning to end. So our evidence demonstrates, beyond a reasonable doubt, that we've got another solid set of episodes with great video and audio quality... just nothing too special beyond the great episodes. Who to Follow: Andrea Barber (Twitter), "Mother. Wife. Runner. Ex-Gibbler." Claim to Fame: Kimmy Gibbler on Full House, perhaps the most obnoxious neighbor in all of television history.